1 Melt 1 tablespoon Spread in 12-inch nonstick skillet over medium-high heat and cook chicken, stirring occasionally, until chicken is thoroughly cooked, about 6 minutes. Remove chicken from skillet and set aside. 2 Melt remaining 1 tablespoon Spread in same skillet and cook onion, stirring frequently, until tender, about 3 minutes. Stir in rice and cook until coated, about 1 minute. Add water and Knorr® Homestyle Stock - Reduced Sodium Chicken. Bring to a boil over high heat. Reduce heat to low and cook covered, 15 minutes. 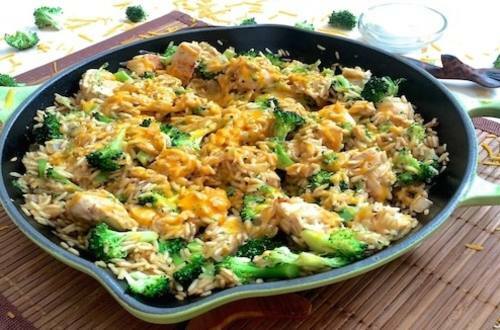 Stir in broccoli, and cook, stirring occasionally, until broccoli is crisp-tender and rice is tender, about 5 minutes. 3 Stir in chicken, 1/2 cup cheese and sour cream. Sprinkle with remaining cheese, cover and let stand until cheese melts, about 2 minutes.